Toluna Surveys Review: an in Depth Look! When it comes to paid survey sites, Toluna is an easily recognizable name for many. But if you are among the few who don’t know much about this site, I am presenting you here with an in-depth review of this marketing research firm that will tell you all you need to know about the site. However, before going onto that, I feel the need to explore more about Toluna Survey Center and how you earn money with the site. This online panel is operated by its owners, i.e. the Toluna Group Ltd, which specializes in market research and has its American headquarters in Dallas, Texas while the international headquarters is located in Paris. The company is considered one of the world’s leading online panel and survey-technology providers much like Pinecone research. With 16 offices in Europe, North America and Asia Pacific, the company works with some of the world’s leading market-research agencies, media agencies and corporations. The company’s research has been used by many organizations, such as Financial Times, Advertising Age and Time Magazine. The company is also credited as a pioneer for recruiting online survey takers. And it seems like their development and improvement never stops as is evident from their recent launch of SmartSelect™, a sophisticated respondent selection methodology for assuring sample representativeness and increasing response accuracy. Their two other famous products in the research industry are PanelPortal™ and QuickSurveys™. The site also boasts of more than 2.5 million active members around the world. The company’s presence in the United States and Canada has only increased further after it acquired two survey panels of repute, viz. Greenfield Online and Your2Cents. Members of these two survey panels were migrated to Toluna’s own panel. As is customary with my reviews of real paid online surveys sites, I checked out their standing with the Better Business Bureau. Not only is the company accredited by the BBB but also holds an A+ degree from the organization. This is by far the best sign of legitimacy you can hope to come across. Additionally, I also saw around 17 complaints on BBB regarding their product/service. However, all the 17 complaints were resolved, which goes to show that the company does care about the satisfaction of its customers. BBB has been notified by the legitimate Wilton, Connecticut based Greenfield Online that it is not affiliated with a bogus check cashing operation called Greenfield Financial. BBB has a separate report on Greenfield Financial. As has been mentioned above, the company has acquired Greenfield Online, which was a legit panel. As such, it looks as if this Greenfield Financial organization is trying to pass off as the genuine Greenfield Online/Toluna and trying to scam people. People are warned to stay away from any such attempts by other companies to pass off as Toluna or any of its acquired panels. If you want to know more about these check cashing scams, you can do so on the FTC’s official site. The reach of the web today is so far and wide that no news can be kept under wraps for long. The same also holds true in case of companies intending to cheat people. I just want to mention a quick thing here before we go any further. I always test out panels I join in different ways. For example, many sites continue to send you emails even after you opt out out of their email lists, basically spamming you. That is a red flag for me. So I sometimes use this as a way to measure each panel’s trust worthiness. Here, I tried unsubscribing from the site using a test account, to see if the company honors its promises, and I was pleased to find out that once you unsubscribe from Toluna, you will never receive any emails from them. So, I’m glad to state that not only is this a big company with a presence in multiple countries; it has also been in the business for more than a decade now, much like Global Test Market or Opinion Outpost. Simply put, this is a trustworthy panel! Now the idea of getting paid for giving your opinions in surveys is not new to you. Toluna.com follows the same concept and allows you to make money with an inclusion of, however, some minor twists. First of all, joining this survey panel is a completely free affair much like My Survey panel and any other legit survey site. You don’t have to pay them a dime and neither do you have to submit any kind of payment info. At the same time, however, the site too does not assure a fixed sum as your earnings. At times, they carry surveys that need participants only from certain demographics, which means there could be a limit to how much you earn. Their surveys can also be answered from an iPhone; that’s neat! The site also doesn’t tell you about the number of points you can earn for every survey you qualify for and subsequently complete. Now for the twists I talked about earlier. Unlike other companies, this one doesn’t offer members a direct payout for each survey that’s completed by them. 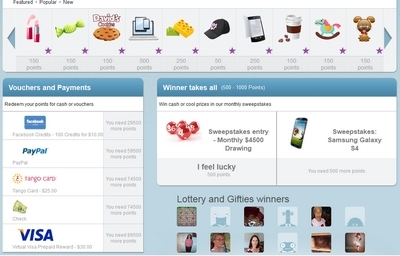 Instead, the company relies on the points format, just like Swagbucks rewards you points for searching instead of giving you a dollar amount, but then the same points can be converted to cash or redeemed for prizes. You are rewarded 500 points on signing-up with the site and from then on, you stand to gain at least 1000 points for every survey completed. Toluna points value: Every 3000 points equals $1. Once you have accumulated 60,000 points, you have the option of redeeming them for a gift card, a check or even a PayPal payment. Now achieving this minimum point’s figure of 60,000 for a payout is not too hard as the average Toluna survey rewards you with around 15,000 points. Plus, this panel also rewards members that are active on the company’s social networks. Creating opinion forums and polls are just two things you can do to get rewarded and more the number of people responding to such polls, more is the amount of money you stand to earn. Lastly, the site also allows you to enter without any fee into drawings held every month that can earn you a prize of $2,500 by simply being a registered member of the site. You also have the option of buying an additional entry into this drawing by exchanging 500 of your accumulated points. As mentioned before, the site also offers a chance to make money via its community. Members can accumulate points here by participating in or starting polls and opinion topics. However, these activities don’t really help you earn a lot of points. But if you perform them consistently they do add up to a sizable figure. In keeping with my regular reviewing style, I decided to check out the views and reviews of other fellow panel members. Among the more prominent issues with this site is that the company lets you participate in a survey, or at least for the better part of it, before informing you about your further qualification. A few people also seemed to be happy that they got a higher than average number of survey invitations from the company (albeit, they also noted that they were able to qualify for only a few of those surveys). There were also a fair amount of noises from members crying hoarse about their points expiring. Turns out that this is indeed true. According to Toluna’s terms and conditions (section 20 under “Expiration of Points”), your accumulated points will expire in case you are not active for a period of more than 6 months. However, that should not be a worry if you intend to participate in their surveys regularly. On the positive side, the site generally enjoys favorable reviews for its instant payout feature. The moment you request for a payout by exchanging your points for a PayPal payment or an Amazon Gift Card, the reward is received within a few minutes. Summing it up, the site’s reviews were a mixed bag. While some people loved the fact that the site paid more (in terms of points/contests) compared to competing survey panels, others liked the fact that the site requires members to be only 13 years old when signing-up (most others require members to be above 14 at the very least). Overall, results from my review and those of others I have read, leaves me no doubt as to legitimacy of this site. So, I do recommend you join Toluna as it is a good paid online survey site that is perfect for those looking to make some extra bucks on the sidelines.